Each issue gives you a variety of challenges in which simple clues are entered in a special grid, in the form of ticks and crosses, and your deductions will lead to a unique solution. Don't worry if your memory isn't that of Raymond Babbitt's in Rain Man or filled with all the information that Stephen Hawking possesses; all you need is the ability to put the facts together and you'll reach the conclusion. 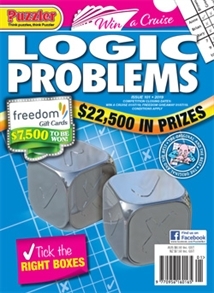 Along with the logic problem puzzles which come in a couple of different sizes, the magazine also includes other popular logical puzzles including Pixel Puzzles (the puzzle of pixelated picture-forming), Enigma (the formation of logical trails), Battleships (the classic find-the-fleet puzzle), Logi-5 (a very early and simple version of an Irregular Sudoku puzzle), Domino Search, Sudoku and Killer Sudoku. There's also a fabulous big-prize competition in every issue.